DIRECT OFFERS AVAILABLE THROUGH OUR E-NEWSLETTER ONLY! SIGN UP HERE! We will be departing for a prolonged international buying trip starting with Pakistan and hopefully inclusive of Afghanistan, Kenya, Tanzania and a few others. We are hoping to return in January to head to the Tucson Gem & Mineral Shows. We are BACKLOGGED and have no anticipated catch-up date. We apologize for our extensive delays and apprecaite your patience on our replies. We will be departing for Africa later today to attend the Tanzania Gem Show in Arusha. We are scheduled to return shortly after the show. We will be departing to Hong Kong to exhibit at the Gem and Jewelry Show at the airport. Please come stop by at 10U14/16! We will be returning to New York shortly after the show. We will be departing to San Diego, CA on the West Coast shortly and are scheduled for a stop over in Tucson before returning in a few days. We are back in New York playing catch-up! Please add us on Facebook to see our latest offerings and acquisitions! It is that time of the year again and we will be departing on our annual Tucson trip momentarily with the fam! Please add us on Facebook to see our Tucson adventures and see our latest offerings and acquisitions! Returned from our Santa Ana Gem & Mineral Show on the West Coast. We are working on some heavy travel plans for rough and crystal acquisitions in anticipation of Tucson and will post updates here as we can. Departed for the Santa Ana Gem & Mineral Show on the West Coast. We are working on some heavy travel plans for rough and crystal acquisitions in anticipation of Tucson and will post updates here as we can. Returned from our Munich Gem Show Trip and a few stops in Czech Republic. We are working on some heavy travel plans for rough and crystal acquisitions in anticipation of Tucson and will post updates here as we can. Departing for Munich to check out the Gem Show. Back from an amzaing show in Hong Kong working on spending some time with the family preparing for pre-Tucson travels. Departing for Hong Kong shortly to exhibit at the Hong Kong UBM Gem Show. Back in New York after traveling to G-d knows how many countries. We are trying to play catch-up before heading out to MA for the Springfield Gem Show. We will be departing for Hong Kong, Thailand and Vietnman on our hunt for gem rough and crystals shortly. We will also be exhibiting at the UMB Hong Kong Gem Show from June 19-22 and hope to see you there! Due to our extensive travels we will have limited access to email and apprecaite your patience on our replies. We returned from our recent trip to Africa and will be in the US for a little shy of two weeks before heading over to Hong Kong and continuing our buying trip in Thailand and Vietnam. We will be departing for Africa shortly on a prolonged buying trip and are presently scheduled to stop in Kenya, Namibia, Nigeria and Tanzania on our hunt for gem rough and crystals. Depending on realities on the ground we are going to try to squeeze in a trip to Vietnam and Thailand. Due to our travels we will have limited access to email and apprecaite your patience on our replies. Updated our website integrating newer parcels which can be viewed on the below links. We will be departing shortly for a prolonged buying trip to Africa and Asia which will include stop overs in Kenya, Tanzania, Namibia, Nigeria, Thailand and Vietnam with additional stop overs possible depending on what ground realities are as we are traveling. We returned to New York from Quartzite & Tucson today and are working on catching-up with everything that has accumulated since our departure. We would like to extend our gratitude to everyone that helped make our Tucson adventure as amazing as it was and we are looking forward to meeting you all next year again! TRAVEL UPDATE: We will be departing in 3-4 weeks for a prolonged buying trip to Africa and Asia which will include stop overs in Kenya, Tanzania, Namibia, Nigeria, Thailand and Vietnam with additional stop overs possible depending on what ground realities are as we are traveling. We will be departing to Tucson shortly and will be stopping by Quartzite for the Pow Wow. Come visit us at the Gem & Jam in early February! We will be in the Tucson area until some time in the middle of February and return back to New York shortly thereafter. If you wish to contact us while we are in Tucson you can give us a call at (718) 658-0792. Returned back from our East Africa expedition and are working on finalizing departure plans for Tucson. We will be in the Tucson area around the 22nd of January Inshall-h.
We are departing for East Africa later today and will be in Tanzania, Kenya and Madagascar indefinitely. We will try to venture into some other countries hunting down Rough and Crystals and continue to post updates on our Facebook Page as time permits. We returned from our recent trip to Hong Kong and Thailand. We did manage to squeeze in a trip to Pakistan for a week or so and managed some minor acquistions there as well. We are presently processing inventory from our recent acquistions and working on finalizing our next trip to Africa within the next week or so to attend the Gem Show in Arusha, Tanzania. We are EXTREMELY backlogged and have no approximate date to catch-up due to our extensive travel plans. We appreciate your patience on our replies! We will be departing today for Hong Kong to exhibit at the Hong Kong Jewellery & Gem Fair running September 11-15. We will try to make it out to Thailand for the Bangkok Gem Show prior to setting up in Hong Kong for a few days. We anticipate on returning some time early in October. Due to our travels we will have limited access to email and apprecaite your patience on our replies. We returned from our North American travels late today after about six weeks on the road. We managed to acquire several rough estates as well as a large stock of replacement parts through Fac-Ette Manufacturing that we will try to make available as time permits. At present we are processing new acquisitions in anticipation of our next trip abroad to Hong Kong and Thailand. FOR ANYONE INTERESTED IN ROUGH VIEWINGS WE CAN ALWAYS BE REACHED AT (718) 658-0792! We are working on finalizing our next Road Adventure and will be deparing within a few days. Returned from our Sainte Marie-Aux & Europe Trip and are in the process of playing catch-up. We will be departing shortly to attend the Sainte Marie-Aux Mines Gem and Mineral Show in France. We will be in Germany, France and Sweden for the better of the next few weeks. Due to our travels we will have limited access to email and apprecaite your patience on our replies. We are back in New York playing catch-up. We are also listing some new items on www.minaux.com via our good friend Marc! Happy bidding! We are headed to Hong Kong later today and should be returning shortly, G-d willing. We are back in New York playing catch-up while working on finalizing our Tax return for before our next departure. We will be headed over to Hong Kong shortly for a prolonged overseas adventure. As our plans are finalized we will post updates here. We will be departing for Tucson later today and are scheduled to briefly stop by Quartzite before getting to Tucson. We have LOTS of new facet rough and look forward to seeing you in Tucson. WE CAN ALWAYS BE REACHED AT (718) 658-0792 IN TUCSON! We are tentatively scheduled to be in Tucson by January 22nd and will be there until February 13 or so. Returned from our trip and am working on playing catch-up while preparing for Tucson. We will be departing within a few weeks for Tucson and should be there in late January. We will be departing on an extensive buying & selling trip south of New York via road. we are scheduled to stop along the way in Florida, Georiga, Maryland, New Jersey, North Carolina, South Carolina, Tennessee and Virginia. Our trip may take us to additional locations which will be determined during the course of our Travels. For all those who would like to contact us please feel free to call us at (718) 658-0792! HAPPY THANKSGIVING DAY TO ALL!!! We are getting back up after being out of the country for much of September to October and coming home to Sandy. We are working on repairing our databases here after Sandy's elecric surges played a number on our systems. We are glad to say that we do have our systems up and running; however, there has been extensive damage to our electronic information and it will be some time before we are back to where we were before Sandy. We apologize for any inconvenience this may cause and thank you for your patience and patronage. We are flying out today to Hong Kong for the Bankok, Thailand & Hong Kong Gemshows! We have been on the road for the better of the last three months meeting with clients, purchasing and selling rough and cut gemstones up and down primarily the East Coast. We are now briefly back in New York getting ready to head East for the Bankok, Thailand & Hong Kong Gemshows! We have not finalized our attendance plans at the Bankok show in Thailand starting on September 13 as of yet; however, We will be set-up in the Hong Kong AsianWorld-Expo Gem Fair in the US section - Booth 8J31! The show will be starting on September 19 and run until the 23rd! We are working on departing within the next few days and will post an update shortly before our departure. Getting ready for a stint south into Pennsylvania. We will be visiting the area for several days to the better of up to 10 depending on how things go. We updated our site to reflect current availability and are in the process of playing catch-up. WE WILL BE AT THE NEW YORK METRO GEM SHOW FROM MAY 10TH - 13TH! The show is located at the Meadowlands Exposition Center! We will have a variety of faceting rough, cut gemstones and mineral specimens! We returned to New York from our recent trip to Africa only a few days ago and are still working on getting caught up and as well as sorting through rough. This is our first direct new offering in quite some time. This is a New Malaya Garnet Mix from Ruangwa, near Lindi in southern Tanzania. This material ranges in size from 2.12-5.67 Carats with the average size being about 3.6 carats based on a blind pour. The material is running about 85%+ High to Top Facet Grade with some of the material having typical inclusions for the species; however, you will get an awesome stone from most of the stones in here. This material is being sold on a blind pour with a 20 Gram minimum for $16 Per Gram! Anyone interested please feel free to email us with your requirements. We returned to New York from our recent trip to Africa and are working on getting caught-up. We apologize for any inconvenience this may cause and thank you for your patience and patronage. Departed for Turkey, Kenya & Tanzania! We are scheduled to be abroad for roughly 4 weeks. Due to our travel plans all email replies and orders will be put on hold until late April after we have returned and settled in. We apologize for any inconvenience this may cause and thank you for your patience and patronage. We returned from the Tucson Gem & Mineral shows are are working to get caught-up on everything that has piled up since our departure to Hong Kong roughly 2 months ago. Please note we are working on finalizing travel plans to Africa and are expected to depart shortly. Departed for Tucson and are tentatively scheduled to return on the 14th. 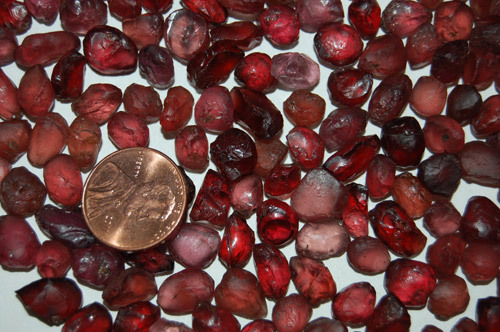 We returned to New York from our Africa Trip and are working on departing for the Tucson Gem and Mineral Shows with a variety of new rough including several kilos of the new Tanzanian Malaya Garnet. Departed for Hong Kong! We are scheduled to be in Hong Kong for roughly 4 weeks and will continue our journey from there with Mike to Ethiopia moving on to Kenya and than Tanzania before returning to New York for the Tucson shows. Due to our travel plans all email replies and orders will be put on hold until our return from Tucson in the middle of February. We apologize for any inconvenience this may cause and thank you for your patience and patronage. We are back from touring New Mexico, Arizona and California. We even got to check out the Queen/King Mines a bit in Pala thanks to Eric! We will be in New York for a short period of time and will be traveling out of country hunting for more rough thereafter. The emails have continued to pile up and we have had little time to reply. We are working on playing catch-up again before our travels as best as we can and appreciate your patience. We are off to the West Coast and will be in the area for the next few weeks before returning to New York. Returned to New York and will be departing to the west coast shortly. We are off to Toronto and will be in the area for the next few days before returning to New York. We are back from Germany. Please note that we have a backlog of emails due to our extensive travels overseas and are working to play catch-up. We will be heading out to the Munich Gem and Mineral Show and will not be back until the 31st or so of this month. Please note that we have a backlog of emails due to our extensive travels overseas and are working to play catch-up. We recently purchased an extensive collection of parcels we sold in the past to a client on the west coast that recently passed away - Mitch Hobler. Mitch was an early client who purchased many parcels over the years and a good friend. G-d willing he is in a better place now. We have integrated the parcels that were aquired into our website and you can click on the below links to review and purchase them. We have returned from Hong Kong and will be in the US for the next few weeks before heading back over again. We will be posting an update as travel plans are finalized. Please note that we have a backlog of emails due to our extensive travels overseas and are working to play catch-up. We will be departing to Hong Kong shortly for the gem show there and will be returning on October 7th or so. Due to our travel plans all email replies and orders will be put on hold until our return. We apologize for any inconvenience this may cause and thank you for your patience and patronage. We returned to New York and are playing catch-up and preparing for the Springfield Gem Show as well as our next trip to Hong Kong early next month. We will be heading to the Franklin, North Carolina Show shortly and will be set up at the Faceter's Frolic on the 28th. We will be in Franklin until the end of the week before heading up to Spruce Pines and than return to New York and prepare for our next trip to Hong Kong. WE CAN BE REACHED AT (718) 658-0792 WHILE WE ARE IN NORTH CAROLINA! We will be departing to Hong Kong later today and will be overseas in South East Asia for the next month or so. Please be patient as it will be some time before we reply to incoming emails. Updated our Press and Publications page to reflect revised links and our new publication on Trapiche Emerald Imitation. We sent out our latest Select E-Newsletter and are working on finalizing travel plans for the Far East. We have LOADS of new rough that we will be listing as time permits once we are caught-up. Thanks for your patience and patronage. We attended the Franklin, N. J. Gem & Mineral Show. Updated our Press and Publications page to reflect revised links and our new publications on Diopside from Pakistan and Trapiche Emerald Imitation. We recently returned from East Africa/Tucson and are playing catch-up in New York with everything that has piled up since our departure. We have LOADS of new rough and LOTS of Ethiopian Opal that we will be listing as time permits once we are a bit caught-up. Thanks for your patience and patronage. TRAVEL PLANS HAVE BEEN FINALIZED!!!! We have finalized travel plans and will be departing to Ethiopia on the 5th of November. We will be away in East Africa until mid-January with stopover in Kenya and Tanzania before returning for the tail end of the Quartzite Gem Shows and than Tucson. Due to our recent move we have been overwhelmed with everything going on and are severely backlogged with emails. We appreciate your patience and apologies for any delays in replies and follow-ups. We will be sending around an email within a few days with the launch of our new auction site. Returned from our Colorado and Utah trip and are working on getting our address and contact information sorted out for our new location. We will be posting updates to our site for new contact information as time permits. Departed for Colorado for the Gem and Mineral Shows. We will be Colorado until October 10th and will be touring through Utah if time permits. Due to our travel plans and recent move we ask for your patience in communication delays. We will be working on getting caught up after our return in October. We are in the process of relocating to a new location out in Long Island. We will be updated our contact info and shipping address once such has been finalized. In addition, we are working on finalizing our trip to Colorado for the Denver Gem and Mineral shows. Updated our site to reflect Sold Items and availability. Updated our Press and Publications page to reflect revised links and our new publications on Diopside from Ihoshy, Madagascar and Tsavorite and Green Garnet from Afghanistan. Returned from our trip to the Gem Shows of North Carolina with lots of new goodies. We are expecting the return of the rest of the family from Canada and are working on getting caught up. We have already begun working on our next E-Newsletter and hope to release it over the next few weeks. We are heading out to the Gem and Mineral Shows in Franklin, North Carolina and will follow-up with the Spruce Pines Gem and Mineral Show. For all those in the area we will be set-up at the Faceter's Frolic in Franklin. Came in from our trip to Colombia and Mexico late in the evening and are working on playing catch-up. We are working on finalizing travel plans for the North Carolina gem shows and will keep you updated as plans are finalized with particulars. Please note that we are in the process of migrating servers and resolving emailing issues and request your patience. We will be departing to South America on Monday - June 7th and will be returning in early July. We will NOT be responding to emails nor answering calls until our return and appreciate your patience. We will be departing to California later today and will be returning on the 25th of this month. We will NOT be responding to emails nor answering calls until our return and appreciate your patience. Returned from Canada late in the evening after roughly a month abroad. Please note we are backlogged due to our overseas trip and we are working on getting caught up on emails and requests. We will be sending an email around shortly after getting caught up with future travel plans and a possible new E-Newsletter. We have finalized departure plans for overseas and will be gone from the 19th of this month until the middle of next month barring anything unforeseen. Please note we are still backlogged and it will be some time before we are caught up on emails and requests. We have finalized our first E-Newsletter for the year and will be sending it out momentarily. Please note that we spent the better of the last week or so converting our site over to a new platform. We are still working out some bugs with the migration. We have numerous new broken links and they will be repaired in the near future. We returned from Canada today and will spend the next few days getting caught-up on outstanding orders and emails. We will be departing for Canada later today and will be returning shortly. Returned from Tucson late in the evening. We are working on catching-up with backlogged emails; however, we will be departing to Canada for several days shortly and therefore ask for your patience. We will be departing to Tucson today and return in roughly Mid February. Returned from our Pakistan Buying Trip with lots of new goodies that we will be receiving in Tucson. We are presently scheduled to depart on the 23rd. Please note we ARE extremely backlogged with emails due to our travels; however, we will work at playing catch-up upon our return from Tucson in Mid February. We will be heading to Pakistan today and return in roughly two weeks to head out to the Tucson Shows. See you all there! Returned from an extended overseas trip to Canada. We will be working at getting caught-up over the next few days and finalizing a rough buying trip to Pakistan shortly before returning to go to Tucson and possibly Quartzite. Returned from Ethiopia and are getting settled in. We will be departing to Denver shortly after getting caught-up and having our incoming shipments from Ethiopia clear customs. We will be departing for Ethiopia later in the evening today and will be returning in roughly 2 weeks before departing for the Denver shows at the end of the month. Please note, due to the ongoing traveling email responses will continue to be delayed. Please feel free to send any email requests for Opal or other Ethiopian stones to us via email. Updated our Press & Publications page and sent around our First Parcel E-Newsletter for the year. We are working on finalizing travel plans to Winnipeg, Canada and will update our site as plans are ironed out. We ask for your patience in our email responses due to heavy traveling as of late. Returned from the Springfield Gem Show and are working on completing our next E-Newsletter before finalizing additional travel plans to Canada and than Denver for the Gem Shows. Returned from North Carolina and will be departing to the Springfield Gem show on the 6th. We will be returning from Springfield on Sunday the 9th and begin wrapping up our next E-Newsletter before finalizing additional travel plans. WE ARE OFF TO THE NORTH CAROLINA SHOWS: FRANKLIN AND THAN SPRUCE PINES. WE WILL BE MAKING A QUICK STOP IN FLORIDA FIRST AND WILL BE RETURNING IN EARLY AUGUST. We officially exited "Baby Mode" today and sent around an email with pictures and particulars on our newest addition to the family - "Lil' Mo." We are already working on our next E-Newsletter and will be heading back to North Carolina for the Franklin and Spruce Pines shows shortly. We are tentatively expected to return in early August and will post updates on our departure and other happenings as time permits! We are heading out of town to North Carolina stopping along the way and will update you upon our return. After almost 50 hours of insanity we welcomed the newest addition to the family today. We will send out some pictures and info as time permits once things calm down. WE ARE IN "BABY MODE"
WE ARE PRESENTLY "EXPECTING" HERE WITH AN ESTIMATED DUE DATE IN MID MAY! DUE TO ALL THE HAPPENINGS HERE IN ANTICIPATION OF THE NEW FAMILY MEMBER IT IS CHAOTIC AND WE ASK FOR YOUR PRAYERS AND GOOD WISHES! WE APOLOGIZE FOR OUR UNRESPONSIVENESS TO EMAILS AND APPRECIATE YOUR PATIENCE. WE WILL GET BACK TO YOU AS SOON AS TIME AND EVENTS ALLOW! Sent around a Special Equipment E-Newsletter offering GIA Microscopes and other Gemological Instruments acquired in a recent buy-out. Sent around our fourth Select E-Newsletter of the year. Ethiopian Opal - New Deposit - SOLD OUT! Orange Kyanite - Metaphysical Grade - FIRST BATCH IN AND ALMOST SOLD OUT! Sent around our second Select E-Newsletter of the year and are hard at work playing catch-up on piled up emails. Returned to New York from Tucson late in the evening. We will begin working on outstanding emails and orders shortly. We will be departing for Tucson shortly. At present we are scheduled to visit the Quartzite and Globe shows before the shows start in Tucson and we will even try to slip in an E-Newsletter or two while in good ol Arizona! OUR TRIP TO TUCSON HAS BEEN FINALIZED AND WE WILL BE DEPARTING ON THE 12TH OF JANUARY AND RETURNING IN THE MIDDLE OF FEBRUARY. WE WILL BE POSTING CONTACT INFORMATION ONCE WE ARRIVE IN TUCSON! Send around our first Select E-Newsletter of the year! Integrated all recent E-Newsletters into our website! We are in the process of reorganizing our navigational structure to accommodate Select E-Newsletter parcels. We have finalized departure plans for Tucson and are making preparations for wrapping things up in New York prior to our departure! Updated the site to accurately reflect inventory! Sent around our Fifth Select E-Newsletter for 2008. Sent around our Fourth Select E-Newsletter for 2008. Sent around our Third Select E-Newsletter for 2008. Sent around our seventh E-Newsletter for 2008. We updated our Press & Publications Page and are working on updating our site to reflect current inventory. Sent around our Sixth E-Newsletter for 2008. We are back in New York and are working on getting caught-up on everything that has piled up here due to our absence. We will be getting caught-up with emails over the next few days and will hopefully send out an E-Newsletter within the next week or so. We departed for Winnipeg, Canada today and will be working on setting up shop there over the next few weeks. We presently do NOT have a return date confirmed. Due to our travel plans and the nature of our trip all correspondence and orders will be put on temporary hold until further notice! We will work on getting back to emails as time permits but will be spending the bulk of our time readying here for an "outpost" into the Canadian market. Returned from Denver and have finalized plans to depart for Winnipeg, Canada on the 29th of this month. Due to our travel plans all correspondence and orders will be put on temporary hold until further notice! We will be departing to Denver later today and are scheduled to return late in the evening on September 19th. Due to our travel plans all correspondence and orders will be put on temporary hold until our return! Please note we have finalized travel plans for Canada at the end of the month and will be abroad for several weeks. We will post updates on dates upon our return from the Denver Gem & Mineral Shows. We will be departing to Tennessee and North Carolina later today and are scheduled to return late in the evening on August 30th. Due to our travel plans all correspondence and orders will be put on temporary hold until our return! Updated the site to accurately reflect current inventory and integrated all recent E-Newsletters except #5 into our website! Copyright © 2000-Present by Intimate Gems. All rights reserved.